Rinfret Shows off her Palm Beach Style for Kips Bay — Rinfret, Ltd.
Cindy Rinfret may be known for Greenwich Style but the Kips Bay Palm Beach Show House proves that she is a pro when it comes to Palm Beach style. In case you have been living under a rock, the Kips Bay Show House is the most prestigious Show House in the country and for the second year in a row Kips Bay has a featured showhouse in Palm Beach (in addition to New York City). 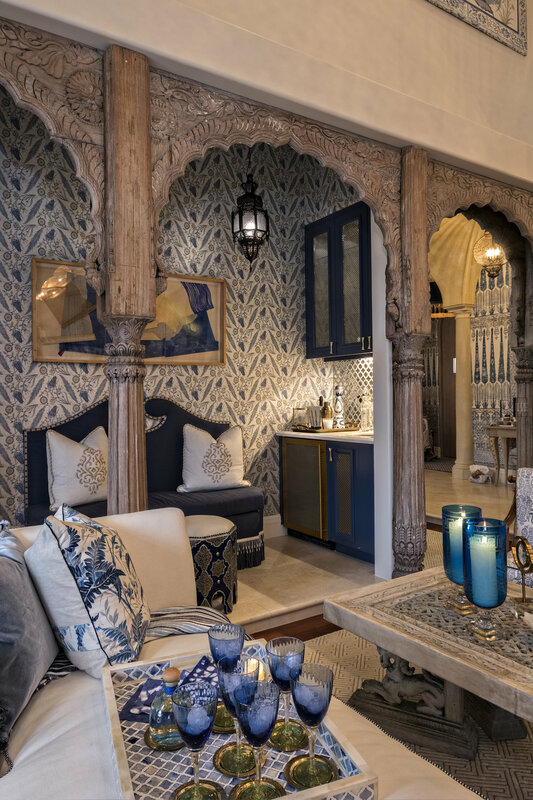 The best designers from across the country were selected to participate in this year’s Kips Bay Palm Beach Show House and Rinfret was given the most prominent room in the home to design. The space is the first one you see when entering the show house and it makes quite the first impression with sprawling ceilings and a lot of square footage. For the design of this important space, Rinfret called upon her most trusted vendors. The inspiration for the design began with a collaboration with the noted textile and wall paper designer, Nicolette Mayer. They created breathtaking wall panels with intricate Moroccan patterning that add to the drama of the high ceilings. Complimenting the wall panels were custom embroidered Holland & Sherry wall panels fabricated by The Shade Store. For the furnishings, Rinfret layered in antiques with luxurious and inspiring fabrics and furnishings from some of the best brands in design. Fine antiques sourced from the Antique & Artisan Center and Greenwich Living in Stamford make one feel like they have entered the home of a cultured globe trotter. 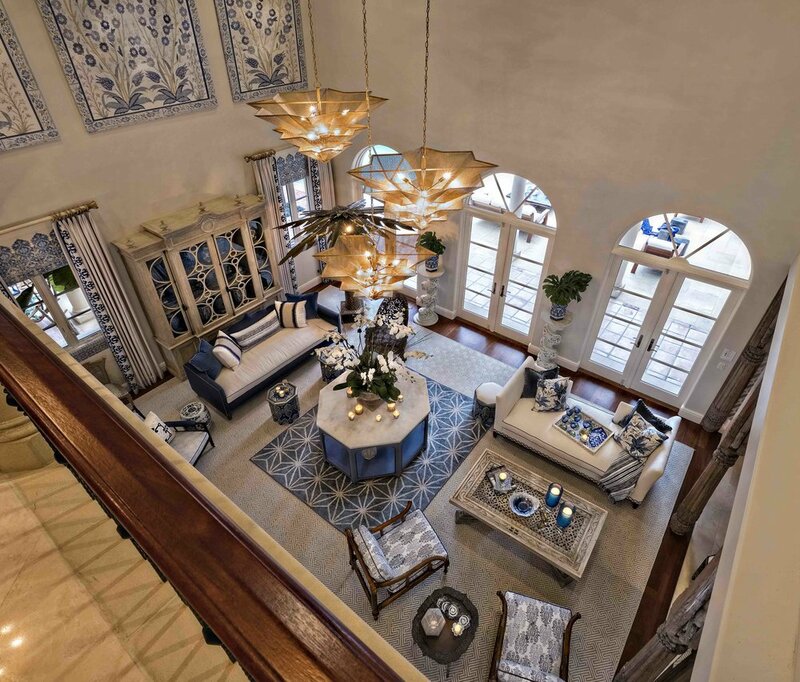 Custom Holland & Sherry window treatments heighten the sophisticated atmosphere and beautifully play off the gorgeous blue and cream fabrics from Duralee and intricate trim from Samuel & Sons. The response to Rinfret’s design of this key space in the Kips Bay Palm Beach Show House has been overwhelming. We hope that you will have the chance to experience this remarkable design first-hand. The Kips Bay Palm Beach Show House is open through February 20th and Cindy Rinfret will be doing a book signing and talk on February 16th. Visit The Kips Bay Palm Beach website for all the details. Want to read more? Here is a round up of some of the press thus far, enjoy!